As the name implies, Midway Geyser Basin, also called "Hell's Half Acre" by the famous author J. Rudyard Kipling, is located half way between Upper and Lower Basin. It occupies the southern section of a hydrothermally active depression and caldera ring fracture zone between the 160,000 years old Mallard Lake Resurgent Dome in the southeast and the Madison Plateau lava flows in the west. The much larger, northern section of the depression is home of Lower Geyser Basin, so from a geologically point of view Midway Geyser Basin, separated only by a forest of lodgepole pines, is virtually part of it. 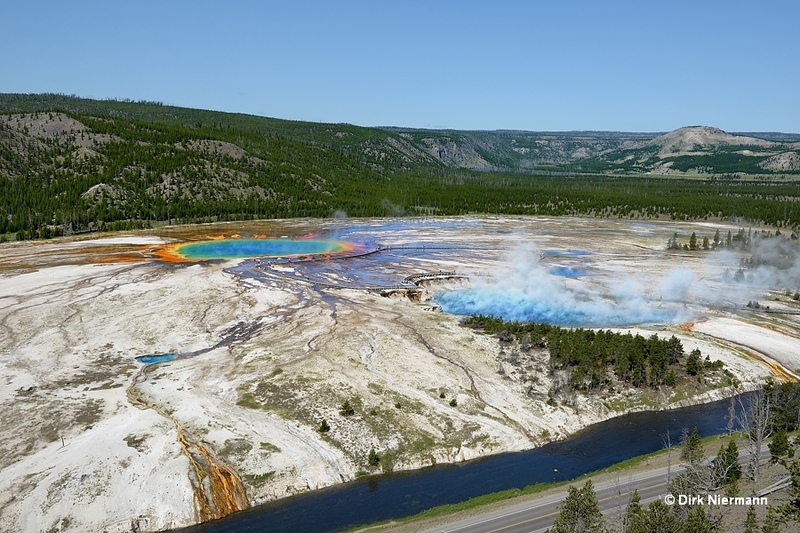 Compared to the adjacent geyser basins it is relatively small, extending only 1.5 km (1 mile) alongside Firehole River, so nearly all thermal areas are easy to reach and to observe. Excelsior Group (including Grand Prismatic Spring), Flood Group, and Rabbit Creek Group are lined up along the highway. Only Rabbit Creek Hot Springs and Rabbit Highland Hot Springs, collections of colorful pools, paint pots, and some small geysers, are true backcountry areas and lack any trails, but they are at moderate hiking distance. Even if the Rabbit Highland Hot Springs are seldom visited, four of their features, the so-called "Tomato Soup Pools", have gained some renown because of their brilliant brick-red colors.